Cash remains the most commonly used method of payment, accounting for 85% of transactions worldwide. Peter Drucker wrote “Efficiency is doing things right. Effectiveness is doing the right things.”1 Effectiveness measures whether the actual output meets the desired output. Applied to payment instruments, effectiveness could be measured by the overall volume of transactions, the value of transactions, the rate of failed transactions, etc. Measuring cash transactions is challenging as they are anonymous and not necessarily registered at individual level. A number of countries have undertaken payment diary studies in order to gain a better understanding of cash usage. A comparison of the results of payment diaries in seven countries are aggregated in the ECB paper Consumer Cash Usage: A Cross-Country Comparison with Payment Diary Survey Data2. The results are summarised on page 49. In all seven countries, cash is the leading payment instrument measured in terms of transaction volume, well ahead of debit cards and credit cards. The share of cash varies significantly across countries, from 46% in the US to 82% in Austria and Germany. Debit cards are the second most widely used instrument followed by credit cards. In spite of all the hype around ‘new’ payment alternatives including mobile wallets, or virtual currencies, other instruments play a marginal role, with the exception of France where cheques are still widely used, although their volumes are steadily declining. In value terms, the role of cash is less significant. The data clearly demonstrates that cash is used essentially for low-value transactions. In all countries cash is predominant for the smallest 50% of transactions. In three countries – Australia, Austria and Germany – cash is also the leading instrument overall. Cash is recognised as a convenient and user-friendly payment instrument. Particular efforts are directed towards vulnerable groups such as the blind and visually impaired. Considerable efforts are put into user-friendly banknote design. Designers focus on making notes easy to recognise and authenticate while difficult to counterfeit. Specific efforts have been aimed at assisting the blind, the visually impaired, and the illiterate to identify the various denominations and their authenticity4. These include different sizes, different colours, large and visible numerals, tactile properties. Various devices are available to help the blind recognise the notes; these range from simple manual tools, which measure the size of the note, to automated readers, particularly in countries such as Canada where all denominations are the same size5. New smartphone applications can now recognise notes, including different currencies by using the camera. It is worth noting that with the ageing population, the number of people with visual impairment is expected to increase. These efforts are recognised by consumers. 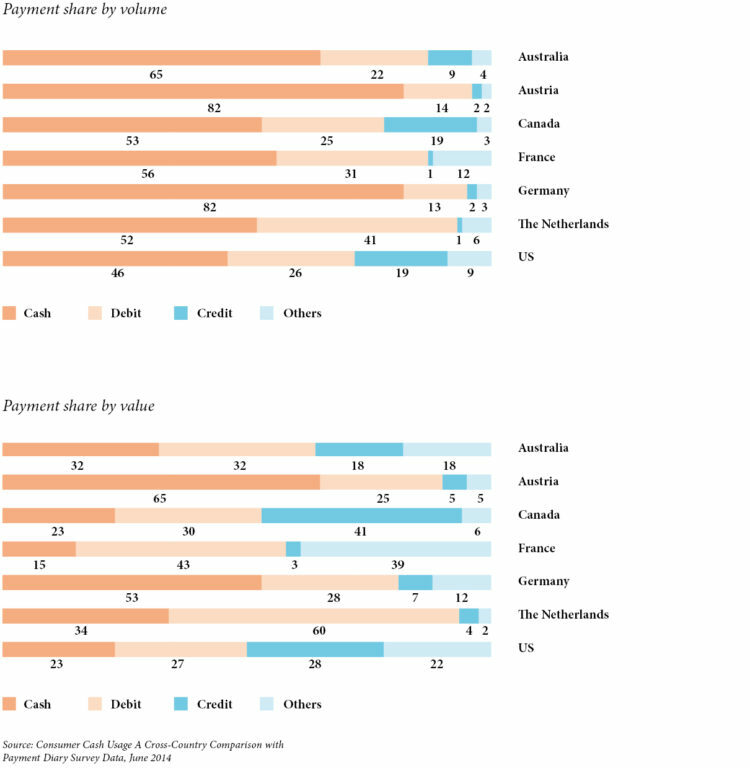 The perceptions of different payment instruments has been compared across six countries – Austria, Canada, France, Germany, the Netherlands and the US – in Consumer Cash Usage, a Cross-Country Comparison with Payment Survey Data 6. Cash is ranked higher for ease of use than debit cards in three countries – Austria, Canada and Germany – and higher than credit cards in all countries but the US. The authors conclude that the perceived ease of using cash was highly significant and positive. Considerable efforts are put into user-friendly banknote design. Designers focus on making notes easy to recognise and authenticate while difficult to counterfeit. The European Commission measures the perceptions of the euro, including the practical aspects of handling coins and banknotes, through regular polls covering all 18 member states of the euro zone7. An overwhelming 94% of respondents think that it is easy to recognise and handle euro banknotes. The polls show that 79% of respondents find it easy to distinguish and handle euro coins. The Dutch Central Bank has been investigating the psychological aspects of choosing a payment method using two innovative approaches: a virtual-reality study and a neuro-scientific study8. The virtual reality study consists of observing payment behaviour and attempting to influence it by manipulating different variables. These include the physical security of the environment, the budget of the participant, the promotion of different payment instruments and time pressure to make the payment. The neuro-scientific study is based on the analysis of brain scans as participants watched videos of cash and card transactions. The scientists observed which part of the brain was stimulated and deduced the emotional perceptions associated with making payments by cash or card. The authors draw two main conclusions from this research. The first is that the choice of a payment instrument is not driven by a conscious decision but largely by habit. Paying by cash or with a card is essentially part of one’s automatic behaviour. This explains why it is so difficult to influence this choice. Secondly, paying with cash is associated with more positive emotions than paying with a card. Measuring the cost of payments is a complex task and results vary, depending on the market, the scope of the analysis and the methodology. However, the cost of cash remains the benchmark against which the efficiency of other instruments is measured. The study also compares the variable costs of different payment instruments per transaction and finds that cash is cheaper than debit cards, credit cards and electronic wallets. There are significant costs involved with making payments. They vary from 0.12% of GDP in Finland to 0.99% in Hungary. In a separate paper10, the ECB has estimated that on average, the cost of payments is 1% of GDP (based on a sample of 13 EU countries). If we extrapolate this to the world, the overall global cost of payments amounts to roughly $760 billion, and this is probably a conservative estimate. In comparison, this exceeds the revenues of the airline industry, estimated at $745 billion11. The cost of cash is in line with the share of cash as a payment instrument. In the ECB study, cash payments represent nearly half the total costs. 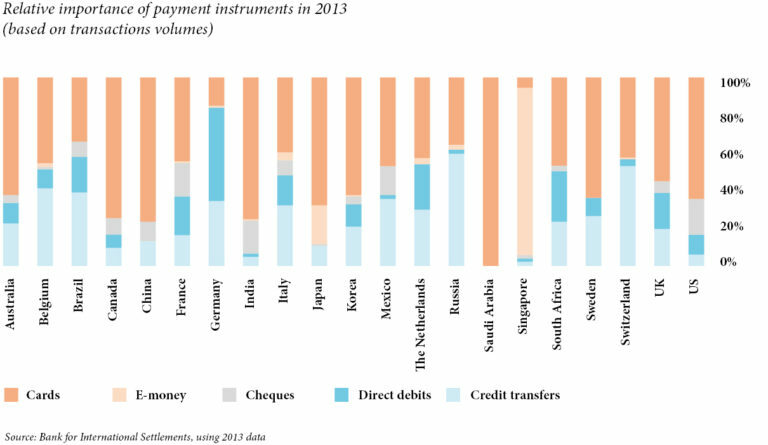 Cash payments represent the lowest unit cost per transaction in all countries but Sweden and Australia. The structure of cash-related costs differs from that of electronic payments. The costs of electronic payments are essentially fixed as they are related to the infrastructure. On the other hand, cash-related costs are both fixed and variable. Items such as processing and transportation, as well as the opportunity cost of holding cash inventories, increase with the value of the transaction. As a result, cash is more cost-efficient for low-value transactions. The cost of a cash transaction remains a benchmark and is used to measure the efficiency of other payment methods. Cash is not always the most efficient payment instrument but in some cases it is. And this is particularly true for low-value transactions which represent the bulk of retail payments. In the case of the Netherlands, the cheapest instrument, irrespective of the transaction amount, was e-money13 but the Dutch Chipknip scheme was abandoned in February 201514. The cost of a cash transaction remains a benchmark and is used to measure the efficiency of other payment methods. This is shown in the Merchant Indifference Test15 (MIT), which is used, among others, by the European Commission to establish the level of Multilateral Interchange Fees applied by card schemes. This test ensures that merchants do not pay higher charges than the value of the transactional benefits from using cards. Merchants enjoy such transactional benefits if card payments reduce their cost relative to cash payments. Cash gives consumers better control of their budgets as they can actually see how much money they have. The pain of paying is more intense when cash is used and this encourages sound financial behaviour. Another distinctive feature of cash is that it is a realtime, ubiquitous budget-control instrument. A quick glance into the pocket or wallet immediately tells the consumer how much money is left. This is faster, easier and more efficient than any digital app. This feature becomes essential in times of economic hardship. The recent global financial crisis has provided a clear illustration. In the US, between 2008 and 2009, consumers increased their use of cash and reduced their use of credit cards and, to a lesser extent, debit cards. In 2009, cash payments increased by 26.9% and cash holdings and monthly withdrawals also increased by 26.5% and 29.2% respectively. At the same time, credit card payments declined by 21.9% and debit card payments by 10%16. One explanation is that with the economic slowdown, people needed to keep better control of their budgets and reverted to a form of “envelope budgeting”, preparing separate envelopes for key expenses such as rent, food, school, electricity, etc. Using data from Germany, von Kalckreuth, Schmidt and Stix17 concluded that the need to monitor liquidity is an important reason for cash usage. Consumers who need to keep control over their budgets, and who have elevated costs of information processing and storage conduct a larger percentage of their payments using cash, hold fewer non-cash instruments, withdraw less often and hold larger cash balances than other consumers. The idea that payment behaviour is influenced by the instrument used has been well documented in payments literature. The sensation of paying is more intense when cash is used and the transfer of banknotes can be visualised. Payment cards on the other hand, only require a signature or pin code and the impact is significantly less. Further, the migration to contactless payments has removed the need to enter a code or verify the amount. And with mobile payments, payers do not have to take out their wallet. One report18 even concludes that consumers are more likely to buy unhealthy food products when they pay by credit card than when they pay in cash. Indeed, the pain of paying in cash can curb impulse purchasing of unhealthy products. • Technology has enabled banks to improve the efficiency of cash distribution. Modern banknotes and modern cash cycles have benefitted from significant levels of innovation in recent decades and this has increased the efficiency of cash. Firstly, banknotes and coins incorporate state-of-the-art technology not only to stay ahead of counterfeiters but also to improve their durability. One example is the recent evolution in banknote substrates. Banknotes used to be printed on paper produced with natural fibres, essentially cotton. In the early 80s, various attempts to use substrates based on plastic met with only limited success, but in the late 80s, the Reserve Bank of Australia issued the first banknote on a polymer substrate. The original intention was to reduce counterfeiting but the new substrate also increased the lifecycle of the banknote. In 1996, all Australian notes were switched to polymer. Following this radical change, manufacturers of paper substrates also turned their attention to making notes last longer. In the 1990s significant developments were achieved in the varnishing and coating of notes: the protective coating helped to reduce soiling while maintaining the traditional feel of paper notes. Another innovation was the embedding of synthetic fibres into paper substrates in order to add strength and increase longevity. More recently, several manufacturers have launched “hybrid” substrates, combining layers of paper and polymer. Secondly, central banks have adapted their cash distribution policies with a view to increasing the velocity of banknote circulation and the efficiency of the cash cycle. The optimal model depends on a number of national factors such as the maturity of the payment systems, the number of bank branches and ATMs, and the capabilities of central bank and commercial bank processing. In mature markets, as well as in some emerging countries, there has been a trend for central banks to delegate the processing of banknotes to commercial banks and other operators. This fosters a stronger cooperation between the key stakeholders in the cash supply chain. But it also requires central banks to increase their monitoring and supervisory role to ensure the quality and authenticity of cash in circulation, as illustrated by the ECB decision on the authenticity and fitness checking and recirculation of euro banknotes19. The regulation defines the standards for fitness sorting of notes, the procedures to be followed, and the reporting requirements for banks and commercial cash handlers. Optimising cash inventories throughout the cash cycle. Some central banks have introduced policies to promote the recirculation of banknotes outside central banks and compensate the cost of funding additional cash inventories with balance sheet relief. Some mechanisms, such as the Finnish DEPO scheme, are based on interest compensation; the Bank of Finland compensates private partners for a portion of their interest loss. Other countries, such as Australia, South Africa or the Netherlands, apply a Notes-Held-to-Order arrangement, where the central bank will credit the holder’s account without the cash being returned to the central bank20. It is worth noting that these models have a positive environmental impact as they reduce the need for transporting banknotes. Banknote distribution has been the third area of innovation. The first ATM was deployed in London in 196721 and, according to Retail Banking Research, the installed base will treble from 1 million machines in 2000 to 3 million in 201522. The total number of cash withdrawals is set to reach 103.2 billion in 2015 and the ATM has become the main distribution channel for cash in modern economies. Clearly, ATMs have played a major role in increasing the availability and efficiency of cash. Numerous studies have emphasised that ATM withdrawals are significantly cheaper than withdrawals at bank branches. 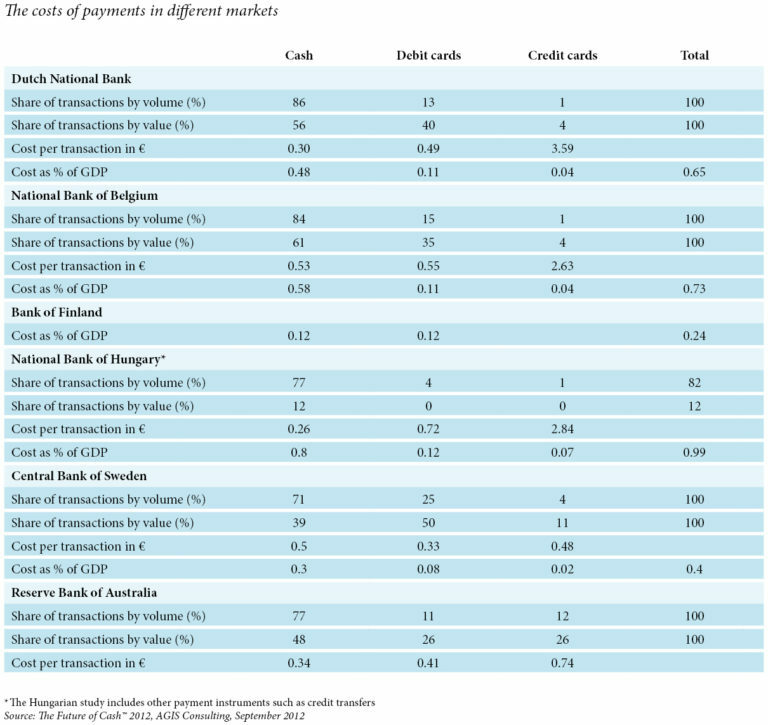 In the US, the difference in cost is about 18%, indicating that technological improvements are an important factor in keeping the number of cash transactions relatively high23. Numerous other innovations contribute to the efficiency of cash. In Kenya, M-Pesa (Pesa is Swahili for money) was launched in 2007 by Kenyan telecommunications provider Safaricom as a money transfer service, enabling users to send and receive money through their mobile phones. Today M-Pesa is the most developed mobile money system in the world and often recognised as one of the key innovations in payments of the last decade. While numerous features have been added to M-Pesa since its inception, it remains essentially a cash transfer system using a network of over 60,000 agents that constitutes a form of branchless banking. According to the World Bank24, in 2012, 21 million Kenyans made 527 million such transactions. Payments are a highly concentrated market and, with growing pressure on prices, operators seek to achieve economies of scale through consolidation. The payments market has experienced a high level of diversification in recent years with the emergence of new channels and instruments, particularly in online payments for e-commerce transactions and m-payments using mobile devices. However, debit and credit cards dominate the non-cash payments market. According to the World Payments Report 201425, the global volume of non-cash transactions reached 334.3 billion in 2012. Card transactions totalled 203.4 billion or 60.9% of the total (debit cards 42.1%, credit cards 18.8%). Cheque usage on the other hand, is declining in all countries. Payments are a low-margin industry and operators compete for market share to achieve economies of scale. This has led to highly concentrated markets and high barriers to entry. In addition, the complex pricing structures that govern payments are essentially based on interchange fees, which tend to restrict competition. In 2008, Bradford and Hayashi26 identified about 20 countries where public authorities have moved to limit the level of interchange fees or merchant discount fees. This list has grown since. An OECD report27 concludes “there is no consensus among economists and policymakers on what constitutes an efficient fee structure for card-based payments, and it is not clear if payment competition might do the trick.” Cash ensures that there is competition among payment instruments. Consumer Cash Usage: A Cross-Country Comparison with Payment Diary Survey Data, John Bagnall, David Bounie, Kim P. Huynh, Anneke Kosse, Tobias Schmidt, Scott Schuh and Helmut Stix in Worling Paper n° 1685/ June 2014. European Central Bank. Making Bank Notes Accessible for Canadians Living with Blindness or Low Vision, Carolyn Samuel, Currency Department. Consumer Cash usage - A Cross-Country Comparison with Payment Diary Survey Data, John Bagnall, David Bounie, Kim P. Huynh, Anneke Kosse, Tobias Schmidt, Scott Schuh and Helmut Stix in Working Paper n° 1685/ June 2014. European Central Bank. IATA Financial Forecast March 2014. This is What’s in Your Wallet… and Here’s How You Use It, by Tamas Briglevics and Scott Schuh - Federal Reserve of Boston N° 14-5.